The holidays are a great time to indulge, but wouldn’t it be nice if there were a healthier way to treat yourself? We’ve got you covered! This dairy-free cashew and coconut cheesecake is full of protein, healthy fats and antioxidants from a variety of seasonal fruits. Enjoy with your favorite cup of tea or a warm cup of Natural Calm to finish off any holiday meal! Add almonds and dates to a food processor and pulse until well incorporated and a paste has formed. Melt the coconut oil and use to grease the inside of four molds in a muffin tin. Press the almond and date mixture into the four molds to create a crust/bottom layer. Add the cashews, sea salt, maple syrup, vanilla, coconut, coconut milk and coconut oil to a food processor and process until smooth, scraping down the sides as necessary. Pour the mixture into the four molds and smooth the top with a spoon. Place in the freezer to firm up for 5–10 minutes while making the topping. To make the topping, add the cranberries, date and water to a small pot. Bring to a boil and then simmer for 10 minutes, or until cranberries have softened and formed a paste. Let cool in the refrigerator briefly. 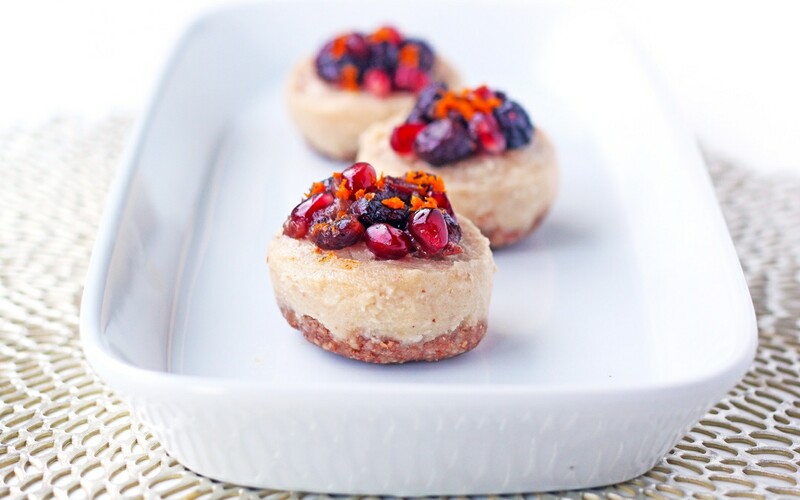 Remove the cheesecakes from their molds, using a knife to scrape around the edges, and top with the cranberry topping, pomegranate seeds and orange zest. Serve immediately or chill in the refrigerator until serving.